slow medicine – not can we afford it, but how can we not? Over the past few decades there has been an increasing disquiet among doctors and patients. Prior to the late 1970s (pre CT/MRI era) other than basic blood work and plain xrays, there was little in the way of testing for disease. 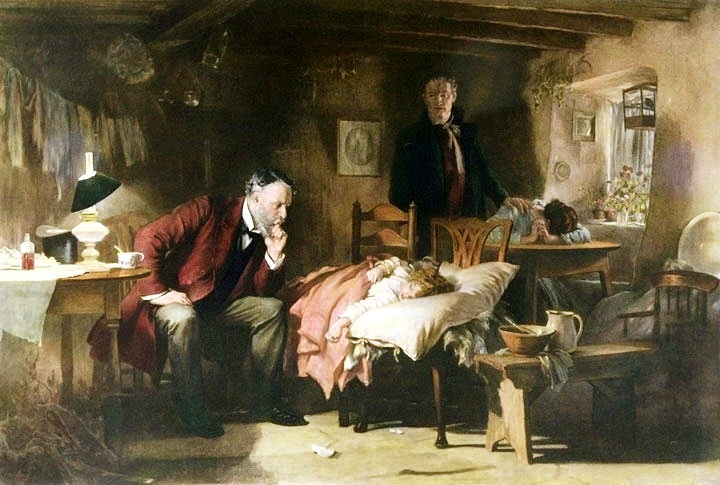 However physicians were well equipped with a robust heritage of patient bedside history-taking and examination skills. Adept physicians in elucidating a pertinent historical record and performing patient examinations were brilliant diagnosticians. Lavishly written patient narratives and exquisite physical examinations filled voluminous charts. It’s no wonder that empathy gets trounced in the actual world of clinical medicine…empathy gets in the way of what doctors need to survive. I always felt like Alice at the Mad Hatter’s Tea Party. I had woken up in a world that seemed utterly logical to its inhabitants, but quite mad to me. Technologies are proposed as a panacea for this situation, with the argument that they might free up the physician from various computational tasks so that he/she can concentrate fully on their patient. Thus far, technology has done the opposite. Design flaws, poor execution and inadequate orientation/education all contribute. The sophisticated computational analysis needed to improve therapies is in its infancy so that carrot is yet to be a significant reality. Additionally, and more importantly, technology cannot replace the human elements in medical care, which are so effective in producing the therapeutic effect. Berci Mesko, the great MD futurist, eloquently said as much in his recently released book “The Guide to the Future of Medicine: Technology AND The Human Touch” (his caps). …ever improving technologies threaten to obscure the human touch, the doctor-patient relationship and the very delivery of healthcare…People have an innate propensity to interact with one another; therefore we need empathy and intimate words from our caregivers when we’re ill and vulnerable. He is convinced that there can be a happy marriage of technology and the human touch but only if we prepare for the changes and work to make that happen. Slow Medicine has been described and applied in various ways over the past several decades. Perhaps the most poignant description of Slow Medicine in in the book by Dr Victoria Sweet : “God’s Hotel: A Doctor, A Hospital and A Pilgrimage to the Heart of Medicine”. Dr Danielle Ofri wrote a moving post about the book which is a description of the last almshouse in the US, Laguna Honda, where patient care was geared only towards the comfort and nurture of the patients. It was hands on, very inefficient yet very effective. Integrative medicine is a type of Slow Medicine model with the goal not just of physical but also mental, emotional and psycho-spiritual wellness. Others such as Dr. David McCullough describe Slow Medicine as applied to the geriatric population. Here slow medicine means a literal slowing of the delivery of healthcare, taking extra time to make sure patients are understanding therapies, allowing more time for decision making, allowing more time for healing, reassessment of drug therapy (even deprescribing) and the presence of patient advocates. I might argue that this geriatric application of Slow Medicine is amenable/useful for a wide swath of the population. Many patients could benefit from this approach. Dr Atul Gawande in his recent book “Being Mortal” movingly addresses the need for a more considered, realistic and sensitive practice of medicine, much more attuned to patients’ lives and desires. Regarding the end of life, such an outlook would be far more cognizant and accepting of human mortality and when further medical care is futile. Others such as Dr Gianfranco Domenghetti and Dr Richard Smith (see BMJ Blog post “The case for slow medicine”) describe slow medicine as encouraging healthy skepticism about the medical market and medical treatments, acknowledgment of conflicts of interest and the understanding that medicine is not an exact science. Part of this model is making sure patients have access to evidence based information and shown data that their health often depends on factors outside formal healthcare such as lifestyles etc. This interpretation stresses the need to pull back from what Ivan Illich called: the hubris (pride) of medicine. Time, sympathy and understanding must be lavishly dispensed, but the reward is to be found in that personal bond which forms the greatest satisfaction of the practice of medicine. One of the essential qualities of the clinician is interest in humanity, for the secret of the care of the patient is in caring for the patient. The history-taking period is when the doctor not only obtains vital clinical information, but also has the opportunity to know the patient as a person—as a human being. This is also when patients begin to know their doctor as a person. It is during the history-taking period that patients decide if the doctor is a robot with no feeling or a caring individual. At times, it is useful to hold the patient’s hand, elbow or shoulder…. (patients) feel comforted ……recognize the human touch as a signal of caring because machines don’t comfort people. We are blessed today to have the “modern day equivalent” :Dr Abraham Verghese (watch his TEDGlobal (see reference list below). His eloquent words of wisdom, love of the profession of medicine and deep love and understanding of humanity are a soothing balm for today’s healthcare environment. This entry was posted in aging, communication, health literacy, patient engagement, the practice of medicine and tagged Bernadette Keefe MD, communication, fear, geriatrics, listening, MD, medicine, nxtstop1, patients, physicians, practice of medicine, trust by Bernadette Keefe. Bookmark the permalink.